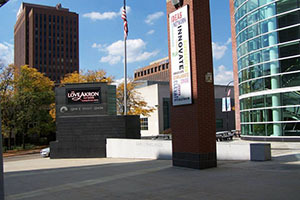 Happy 20th Anniversary, Love Akron! Robert DeJournett, Director of Community Relations & Diversity, Summa Health Systems and Chairman of the Board for the Love Akron Network, welcomed the nearly 700 people at the 3rd Annual Love Akron Awards breakfast Sept. 30. The event, held at the John S. Knight center, brought together a mix of businessmen and women, nonprofit organizations, ministry leaders and local philanthropic groups, as well as political leaders. “The theme for this morning is simply, Servant Hearts. These two words capture the essence of Love Akron’s mission,” said The Rev. Dennis Butts, Associate Pastor at The House of the Lord.